As we have discussed on previous shows, the big banks are required to have mortgage insurance on all mortgages where the borrower has less than a 20% down payment, and the biggest mortgage insurer in Canada is CMHC. According to Michael Chong, while there are two private mortgage insurers in Canada (Genworth and Canada Guaranty), CMHC insures 80% of all insured mortgages in Canada, and they currently insure over $500 billion in mortgages. That’s huge. Mr. Chong’s position is easy to understand: with mortgage insurance, it is almost impossible for a bank to lose money on a mortgage, so they have a strong incentive to lend as much money as possible to maximize their profits. The government has privatized profit and socialized risk through mortgage insurance. Those aggressive lending policies have allowed Canadians to obtain bigger mortgages, buy ever-more expensive homes, and that is one of the main contributors to the very high real estate prices we are currently witnessing in Ontario. Even worse, Mr. Chong believes that since banks can make money risk free on mortgages, they have no incentive to make riskier loans, like loans to small businesses, and that impedes job growth. Mr. Chong believes that, over a period of time, CMHC should be privatized so that mortgage insurance can be properly priced by the free market, changing the model so insurance rates are not set by a government entity. We discuss how the privatization of the CMHC would impact the real estate market, and I give my thoughts on the CMHC on today’s show. Doug Hoyes: This is episode 119 of Debt Free in 30. And today, for the first time ever, my guest is a sitting member of Parliament. That’s right, my guest is a politician. So, before we start let me give the disclaimer that I’ve read many times on this show. Debt Free in 30 exists to provide different perspectives on the world of debt. I regularly invite guests who have different opinions than my own so just because I have a guest on the show does not mean I necessarily agree with everything they say. I’m not a member of any political party, I’m not supporting any particular politician. I don’t pay guests to be on the show and guests can’t pay me to be on the show, this is not an advertising show, it’s a show designed to inform and that’s what we’ll do today. So, with that disclaimer out of the way let’s get started. My guest today is Michael Chong, the member of Parliament for the riding of Wellington-Halton Hills, which is a riding that looks a bit like a donut including everything around the city of Guelph but not the city of Guelph, which is actually where we’re sitting recording this today. The riding includes the town of Fergus, which is where Michael Chong was born. Mr. Chong was first elected to parliament in 2004 and is currently a candidate for the leadership of the conservative party of Canada, which will be decided at a convention in May 2017. So, why in the world am I having a politician on this podcast? Well, simple answer: Mr. Chong wants to abolish the Canada Housing and Mortgage Corporation. And since the overheated real estate market has been a big topic here in 2016 and will probably be a big topic in 2017, I thought it would be interesting to hear a different perspective on the CHMC. So, with that background, Michael Chong, welcome to Debt Free in 30, how are you doing today? Michael Chong: Great, great to be here. Doug Hoyes: Well, thanks for being here so let’s talk about the CHMC then. We’ve addressed it many times on the show before but can you maybe give us the really quick 30 second overview of what is it, what is the CHMC? 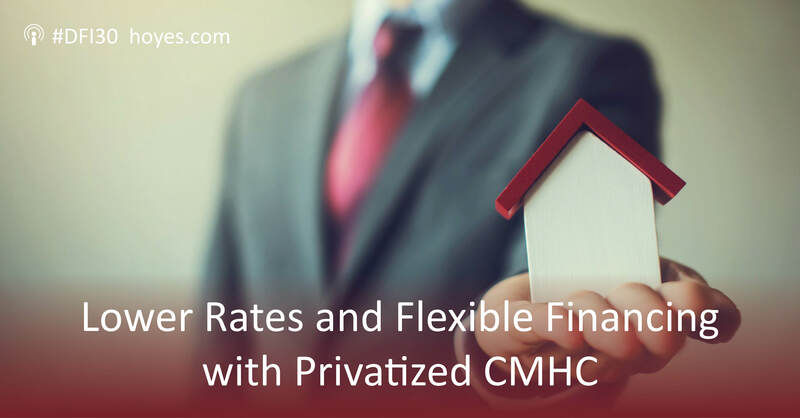 Michael Chong: CHMC is a federal crown corporation that issues government backed mortgage insurance and securitization for Canada’s banking system. It is the largest crown corporation in terms of its assets and liabilities and it’s often one of the least known corporations out there. Doug Hoyes: The largest crown corporation, so in terms of assets. So, what kind of numbers are we talking about, billions of dollars I assume? Michael Chong: We’re talking about 514 billion dollars in mortgage guarantees in force as of December 2016. Doug Hoyes: And the limit that they can insure is 600 billion dollars. So, we’re getting close to the limit then I would assume. Michael Chong: Yeah, the amount that they have insured has come down somewhat from previous quarters but it is, generally it’s at record high levels compared to five or 10 years ago. Doug Hoyes: Do you have any idea why it would have come down in previous quarters? I mean the real estate market is going nuts in places like well, Toronto, Vancouver it’s eased off a bit. Any idea why it would have come down or is it just natural ebbs and flows? Michael Chong: It’s come down because the federal government is desperately trying to cool the housing market and has issued direction to CHMC to reduce the amount of guarantees in force. I think they’re trying to reduce the risk that the Canadian tax payers bare with these guarantees and force and they’re also trying to cool the market. So, that’s why it’s come down from its previous highs in the last year. But even taking a step back from its current amount of 514 billion, it’s still a record amount in the context of the last five to 10 years. Doug Hoyes: And it sounds like a huge number. So, obviously you have some problems with CHMC but let me give their side of the story ’cause this is supposed to be two sided. I’ve done research; I’ve done advance prep here. I went on their website and according to their website “CHMC helps Canadians meet their housing needs, sounds pretty good. As Canada’s authority on housing we contribute to the stability of the housing market and financial system, provide support for Canadians in housing need and offer objective housing research and advice to Canadian governments, consumers and the housing industry. Prudent risk management, strong corporate governance and transparency are cornerstones of our operations”. So, I don’t know what your problem is, these sound like fantastic people, what’s your problem with CHMC? Michael Chong: Well, that to me sounds like a lot of corporate gobbly gook. Doug Hoyes: It brought a tear to my eye, come on. Michael Chong: I mean quite simply the problem is this, that we have a problem in Canada with skyrocketing housing prices and many of Canada’s largest cities that are putting homeownership out of the reach of middleclass families. We also have a problem where the government of Canada now has 514 billion dollars in potential liabilities on its books, liabilities that are born by Canadian taxpayers. I think that that problem is, those two problems, are due to one fact, which is that CHMC has issued mortgage insurance and securitization to the point where it’s become unsustainable. In other words if you – I think the largest factor contributing to skyrocketing housing prices, and there are many factors, but the largest factor is the unsustainable rate of mortgage credit growth in Canada over the last 15 years. And I think that is directly a result of CHMC’s mortgage insurance and securitization program. Look, what we’ve essentially done is we have given the banks profits without any risk because this program, this CHMC mortgage insurance program allows the banks to issue mortgages with no risk to their balance sheet. And so we’ve essentially privatized profits and socialized risk. In other words the banks churn out these mortgages risk-free, backed by government mortgage insurance and they have an incentive to turn out as many as they can to take advantage of that program. That in turn has lead to unsustainable levels of mortgage of credit growth. Some 10 years ago outstanding mortgage, residential mortgages stood at around 700 billion dollars, today we’re double that at 1.4 trillion. That’s an annual compounded growth rate in mortgage credit of around 7%. That’s not sustainable even taking into account population growth and inflation. Doug Hoyes: So, they key phrase you said there we have privatized profits and socialized risks. So, if I’m a banker, maybe you and I should start a bank, that sounds like a pretty good gig. We start a bank and I go out and I loan money on mortgages but I don’t have to worry too much because if the mortgage gets into trouble the taxpayer ultimately is going to say no problem here’s the money. Michael Chong: That’s exactly it. Doug Hoyes: It’s as simple as that. Michael Chong: Simple as that. Doug Hoyes: So, that sounds like a fantastic business, so we should all be starting banks then. So, I guess if CHMC is a good idea then we should have the same thing in every other business too then. Doug Hoyes: You know, if you own a hardware store then the government should guarantee losses if you sell a hammer for too little. I mean that would be the logical extension of it wouldn’t it? Michael Chong: That’s right. And that’s why the banking system, the big banks, have loved this program so much. It’s literally allowed them to issue these mortgages without any risk to their balance sheets. So, out of the 1.4 trillion in outstanding residential mortgage debt in Canada, the Government of Canada has guaranteed 520 billion dollars of that with this mortgage insurance and securitization program. And there’s been another unintended consequence, which is that the banks have shut down their lending to small to medium sized business in Canada. It’s very for SMEs to get access, to get loans, to get access to capital. And that’s because the government of Canada, through CHMC, has actually given banks and incentive not to loan to small to medium sized enterprises. And this isn’t my conclusion, this is the conclusion of the international monetary fund. Some three years ago the IMF’s Chief Admission in Ottawa issued a very public statement saying that CHMC should, and the Government of Canada, should scale back its mortgage insurance business because it’s drying up funding and financing for Canada’s small to medium sized enterprises, which in turn is leading to lower levels of business investment. Literally this program gives a disincentive to banks to loan to small to medium sized business. Doug Hoyes: Which makes perfect sense, if I’m a bank and I’ve got a million bucks sitting here in deposits that I want to lend out, I got a choice. I can lend to Hoyes, Michalos & Associates, a relatively small business but they might not pay me back and I’ll lose everything. And with interest rates as low as they are, I mean I can’t charge them 50% to mitigate the risk. Or I can take that million dollars and put it into mortgages and I know I can’t lose because the government will cover any losses. Doug Hoyes: So, it’s not that the government is telling them not to lend to small businesses, it’s just the obvious conclusion that anyone would make. I can earn a return risk-free here, that’s what I’m going to do. And so what you were saying then is, so let’s get into the options here. So, CHMC is bad, that’s what you’re saying. I’m putting words in your mouth but, you know. So, we got a choice. So, we can do what you said at the outset, what the federal government is doing, which is kid of turn down the taps a little bit. And we’ve had previous guests on the show Ben Rabidoux, Hilliard Macbeth and a few and Ben a couple of episodes ago said well they are doing some things to turn down the tap, they brought in these rules on October 17th, there’s some new rules that came into effect on November 30th, they’re going to be adjusting the capital requirements next year. So, the fire hose is going full blast, we’re going to gradually turn it down and, you know, somehow engineer a soft landing. You obviously don’t agree with that approach. You think no, blow the whole thing up. So, why is getting rid of CHMC better than gradually trying to slow the plane down before it crashes? Michael Chong: Well, I think we should try to slow the plane down and engineer a soft landing as they say, you know, in the language of the industry. But I’m skeptical that we’re going to be able to engineer that soft landing. We have been tinkering around the edges of the mortgage, insurance market now for the better part of six, seven years. Minister Flaherty introduced many, many changes to the program. Bill Morneau, the current Finance Minister has introduced several more changes and they’re talking about even more changes in the future. And despite all these changes and all this tinkering around the edges, the price of housing continues to accelerate to unsustainable levels and mortgage credit growth continues to grow at unsustainable levels. So, I don’t think tinkering around the edges is a long-term solution. I think the long-term solution is to privatize CHMC’s mortgage insurance and securitization business. That is the long-term solution to making housing more affordable. Doug Hoyes: So, let’s assume that in May you become the leader of the party and then, I don’t know whenever the next election is, the boy king gets defeated and you become the Prime Minister. So, do you just on day one say we’re shutting the doors to CHMC? Or when you say privatize, to me privatize means we find some other people to buy it, that’s what privatize in my mind means. And if I’m not mistaken there are two other entities that provide mortgage insurance in Canada today, Genworth and Canada Guaranty. Obviously they are much smaller than CHMC I assume. So, would those, one of those two entities be a logical purchaser of CHMC or do you have some other plan as to how it would actually be privatized? Michael Chong: Well, first off we wouldn’t shut it down on day one, we’d plan an orderly transition to ensure continuity in the marketplace. The second thing we would do is that we would take out all the non-mortgage insurance and securitization assets, out of the corporation and back into a federal government department. So, CHMC does have some other things that they do, such as providing affordable housing for low income families and low income Canadians. We take those programs, spin them out of CHMC back into the federal government department. What we would then be left with is a crown corporation with only the assets of the mortgage insurance and securitization business. We would then consult with the competition bureau and get their advice as to whether or not this single large crown corporation with about 80% market share would have, you know, an unfair monopoly over the market. And if the advice came back that it is, that it would lead to unfair competition, an unfair monopoly, we would look at splitting the assets into two and then putting it up on the marketplace for sale to a private company. So, it would be an orderly plan transition so that Canadians could continue and banks could continue to get mortgage insurance, just not on the taxpayers dime and not – and in a way that’s sustainable. Doug Hoyes: So, I’m a bankruptcy guy as well as being an accountant so I understand what the difference between an asset and a liability is, an asset is something you own and a liability is something you owe. Is CMHC – does CHMC actually have assets? ‘Cause it sounds to me what they really have is liabilities. So, is there anybody out there who would buy this? It’s an insurance company so if mortgages go bad, we got to pay out a bunch of money. But if mortgages don’t go bad we don’t get anything more ’cause we’ve already collected the premium. So, it seems to be it’s a massive liability, not an asset. Would anyone actually pay anyone for it? Michael Chong: Well, they have significant cash on hand. Doug Hoyes: So, all the premiums that they’ve been paid. Not all of them, but they’re building up on the left side of the balance sheet and the liabilities are on the right. And so, the hope is that the assets are greater than the liabilities. Obviously we don’t know, tell me when the market’s going to crash and we can do the math. Michael Chong: Yeah, they’ve significantly increased their fund, their contingency fun for bad debt. I think it’s been more than doubled in the last number of years because they’re starting to realize the risk that’s out there. So, they do have assets. And the assets are significant. And one of the biggest assets is the 520 billion dollar mortgage insurance and securitization portfolio. Yes, there’s liabilities associated with that, there’s also assets associated with that. And the market would have to price that in order to determine what the value is. Doug Hoyes: So, what you’re talking about is doing open heart surgery on the patient while they’re still awake here ’cause this is not a simple thing that you’re describing. So, we want to cool down the housing market ’cause it’s overheated but we also want to sell off this asset. So, we also want the housing market to be really strong when we sell it off because then we get the most bang for the buck. If we let the housing market crash tomorrow then CHMC is in the hole and no one is going to pay anything for it. So, presumably this would be a multiyear process. It would not be like you say on day one. If it was Donald Trump it would be done on day one but we’re in Canada here so presumably it would take two, three, four, five years kind of a thing to wind out of it, is that your thought? Michael Chong: Yeah, I would hope that it would take no more than two to three years to privatize it. My expectation is it wouldn’t take five or six years to do it. Doug Hoyes: So, the obvious question then is again, you know, you’re the Prime Minister, you do this two to three years, get wound out of it. You just said that CHMC has an 80% market share. So, that tells me of all the insured mortgages out there, CHMC has their fingers in 80% of them. So, you take out that from the market, that’s got to have some affect on the real estate market. Michael Chong: Well, we’re not, I’m not proposing to take 80% of the mortgage insurance market out of the – I’m not proposing to take 80% of the market, 80% of the mortgage insurance out of the market. I’m just proposing to change the ownership of the 80% of the mortgage insurance. Doug Hoyes: So, the assumption is the consumers would still be able to get mortgage insurance, I guess it’s not consumers, it’s banks. Doug Hoyes: You’re not insuring the average guy, we’re insuring the big banks. The banks would still be able to get mortgage insurance, it would just be from either Genworth or Canada Guaranty or whatever gets spun out of CHMC as a private enterprise. Doug Hoyes: And so what you’re saying is mortgage interest rates would probably be higher. And I realize it’s not just the mortgage interest rate when I buy a house, it’s there is an insurance fee built into that. Michael Chong: I’m not saying mortgage interest rates would be higher ’cause that’s set by the central bank and by the bond market. What would be properly priced is the risk associated with the amount of mortgages being issued, their amortizations, their – the amount of individual mortgages that are being issued. Those are the kinds of things that start to get properly priced. Currently there’s not a proper price of risk in that area. Doug Hoyes: So as a consumer it’s five years in the future now, so you’ve been the Prime Minister for two years at this point, what do I notice that’s different? Do I notice anything different? There’s some huge changes on the bank’s side obviously because they’re now dealing with CHMC Private Co instead of Government Co, but does the consumer notice anything different? Michael Chong: Yeah, I think the consumer would start to notice several things. First they would start to notice that housing is not accelerating at unsustainable levels. So, in other words housing prices start to moderate and as inflation catches up, housing prices become more in reach of middleclass families. The second thing people would start to notice is that there isn’t a one size fits all solution that’s being imposed on the entire country for the mortgage insurance market. Because the private sector I think would be much more flexible on the way it deals with risk than the current federal government’s approach, which is to say, you know, here’s our change to the mortgage insurance of CHMC and this is going to apply across the country even though it is being brought in because of the problems we’re having in the Toronto and Vancouver market. So, I think there would be greater flexibility with mortgage insurance that would allow consumers more choice and would also allow people who are in markets where the housing market isn’t so heated to more easily access mortgage insurance. Doug Hoyes: So you’re saying CHMC is the Henry Ford Model T approach, you can buy any colour of car in the rainbow so long as it’s black, there’s one colour and that’s it. And you’re saying if it’s privatized there would be many more flexible options presumably. Would you also assume then that small business would have access to better funding because now the banks are going well, we – the mortgage market isn’t quite so lucrative so let’s start throwing some money at some other places? Michael Chong: That’s exactly it and it would free up billions of dollars in capital for small to medium sized businesses because banks would start focusing on lending to SME’s because the risk then becomes more reasonable. Doug Hoyes: So you think the real estate market would moderate but would not crash. Michael Chong: Well, that would be – I mean I don’t know, that’s up to the marketplace, that’s not up to me to pronounce upon. But I think that it’s clear that countries where government backed mortgage insurance is in place have a tendency to have asset bubbles and the corresponding crash. That’s not my conclusion of the IMF. The IMF has done a lot of work on this and they’ve concluded that housing markets where governments intervenes in the marketplace through mortgage insurance have a tendency to create those housing bubbles and the associated crashes. And in the long run this leads to the lower levels of home ownership. You know, the United States today has the lowest levels of home ownership in 48 years. Just before the crash in 2008 they had the highest level of home ownership in decades. And so that is not a good thing for the market to have these huge appreciations in prices and a corresponding correction. What you want is a marketplace where you have sustainable long-term rates of credit growth that allow for a stable housing market. Government intervention in the marketplace does exactly the opposite and that’s the conclusion of the IMF. Doug Hoyes: So your basic point is let’s get the government out of it, let’s let the market decide. So, final question for you then, in addition to what you recommended about CHMC you’ve also got some ideas on OSFI. So, first of all what is OSFI and number two, in broad layman’s terms what do you think needs to be tweaked there? Michael Chong: Well, OSFI stands for the Office of the Superintendent of Financial Institutions. It is Canada’s federal banking regulator. Its role is to ensure the stability of the banking system and to ensure that banks don’t take on too much risk. So, if we are going to privatized CHMC’s mortgage insurance business then we also have to strengthen OSFI. And its oversight not just of the banking system but of the private sector mortgage insurance market to ensure that we don’t have another 2008 financial crisis where banks have taken on inappropriate levels of risk. Doug Hoyes: Do we care if private lenders take on inappropriate levels of risk? Michael Chong: We do because our banks are public utilities. And when big banks fail, the entire economy goes into a tailspin and taxpayers end up having to bail out these banks. Doug Hoyes: They don’t have to. Michael Chong: Well, in practice they have to. Doug Hoyes: We’re lucky in Canada ’cause the last time a bank failed was the depression if I’m not mistaking. Doug Hoyes: The U.S well, they’ve had a few. Michael Chong: We’ve actually had some bank failures more recently, smaller bank failures in recent decades but the last big wave of bank failures was in the great depression. Doug Hoyes: Yeah and they wouldn’t have been the big schedule A banks obviously, perhaps some smaller regional ones. So, ultimately what you’re saying is let’s get the government as far away from it as we can but still have a regulatory presence. Michael Chong: That’s right, so that risk is properly priced. If a large bank fails it becomes the taxpayers’ problem. And we saw that in 2008 with the failure of many large banks around the world. We saw it even in Canada where the government of Canada had to step in and provide over 100 billion dollars in federal guarantees at the time to keep out banking system afloat. So, when large banks get into trouble, the federal government ends up having to bail them out. And so, we want to avoid that situation and we can avoid it by strengthening OSFI to make sure that it is preventing that kind of undo risk-taking by banks. Doug Hoyes: Got it. So, what this really all stems from is the fact that we just got too much household debt too. I mean it’s a chicken and an egg thing I guess, right? But mortgages are a big component of household debt and if we ease back on the mortgage component a bit, that presumably reduces our overall level of household debt and makes us more stable going forward I guess. Michael Chong: Yeah. So, mortgages make up roughly two thirds of all household debt and my view, the chicken and egg is that skyrocketing housing prices are not the cause of high levels of household indebtedness. Rather the opposite is true, is that the easy access to mortgage credit due in large part because the government has privatized profit and socialized risk through mortgage insurance, has created skyrocketing housing prices. Doug Hoyes: So wet sidewalks don’t cause rain, it’s the other way around is what you’re saying. Doug Hoyes: Excellent. Well, I appreciate that Michael. That’s a good overview and gives us all something to think about. I think here in Canada CHMC has been around for I don’t know 70 years or whatever it’s been. So, it’s not something we even conceive of as not being there. But you’re saying that there is an answer so I appreciate you coming and bringing it to us so thank you for being here. Michael Chong: Well, thank you for having me. I know it’s a bit of a dry topic but it’s an incredibly important one, probably one of the most important macroeconomic policies of the federal government. Doug Hoyes: Yeah. And just because it’s dry doesn’t mean it doesn’t impact us so I think being aware of it is a good thing. Thanks for being here. Michael Chong: Thanks for having me. Doug Hoyes: Thank you. That was my discussion with Michael Chong. And just a quick correction, he actually wasn’t born in Fergus Ontario, he was born in Windsor Ontario and then moved to Fergus at the age of two. So, Michael Chong is a member of parliament who believes we should abolish the CHMC. So, what’s my take on the CHMC? Well, I’m not a big believer in government interference. I wasn’t alive back on January 1st, 1946 when the Central Mortgage and Housing Corporation was created, over 70 years ago, to help house returning war veterans. In 1979 the name was changed to the Canada Mortgage and Housing Corporation and today we have a government organization that actively encourages Canadians to buy houses. If you have less than a 20% down payment, the CHMC says to the big banks, lend them the money to get a mortgage and if they can’t pay, don’t worry, we’ve got you covered. The CHMC doesn’t protect you. If you can’t pay and the bank forecloses on your house, then bank gets paid and then CHMC is coming after you for the short fall. But of course the CHMC, being a government entity is not very efficient. I’ve actually had clients who had their houses foreclosed on 10 years ago and only now is CHMC finally pursuing them, often by taking their tax refunds and many years later I end up doing bankruptcies for people who lost their houses many years earlier. Let me repeat that. CHMC doesn’t insure you, they insure the bank. Is that really the role of government? The biggest bank in Canada, the Royal Bank, just announced that their fourth quarter profit was 2.54 billion dollars. That’s not their profit for a full year, that’s their profit for three months. I have no problem with banks making money, I can buy shares in a bank if I want to, many pension funds invest in banks. That’s great. But do the taxpayers of Canada really need to help a bank that makes two billion dollars every three months? I mean I get it; the argument is that the CHMC new homeowners would never be able to buy a house. I disagree. In fact I think it’s the opposite. In fact I think the fact the taxpayers are guaranteeing that a bank an never lose money on a mortgage encourages the banks to lend crazy high amounts and that drives up real estate prices and that makes it even more difficult for young Canadians to afford to buy their first home. And as Michael said in the interview if the banks are lending all that money on mortgages, essentially risk-free, they have no incentive to lend any money to small business and that obviously hurts the economy in the long run. So, if we agree that CHMC is at least part of the problem, should CHMC be reformed or eliminated? Well, as Ben Rabidoux and I discussed back on show 117, that was two shows ago, there are changes that are happening to make it more risky for banks to finance mortgages so the problem may begin to correct. Perhaps those changes will be enough. But Michael Chong makes a good point. If you completely eliminate CHMC there is no need to tweak the rules. There would be no rules because the banks would be fully at risk for their own loans or they would need to use a private insurer, not the taxpayer. Would the abolition of the CHMC cause the real estate market to crash? Well, Michael Chong says no and I guess I doubt it because every house in Canada is not purchased with CHMC insurance but it would likely lead to some price reductions. Ultimately I don’t control the government so I don’t worry about what they do. I only worry about what I can control and so I’ll give you the same advice I give my clients. If you really want to buy a house, crunch the numbers, make sure it’s the correct decision for you and then save up as big a down payment as possible. With a big enough down payment, mortgage insurance is irrelevant. That’s our show for today. Full show notes, including links to everything we discussed can be found on our website at hoyes.com. Next week I’ve got a totally different show for you. My guest isn’t a politician; he’s a PHD candidate who has some very interesting ideas. So, tune in next week for that podcast, it’ll make you think. Until next week, thanks for listening. I’m Doug Hoyes. That was Debt Free in 30. Does The Mortgage Lender You Choose Matter? Is the Sky Falling? Will the New Mortgage Rules Hurt the Real Estate Market?